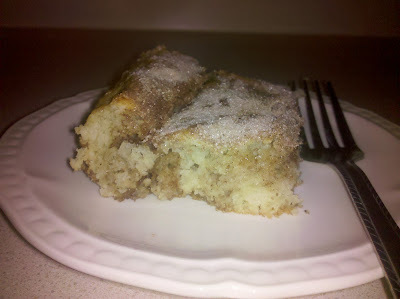 I got the following recipe from my grandma Una Sutter and besides this coffee cake recipe being super easy, it’s also super yummy! Mix ingredients. Pour half of batter in 8′ round or square greased pan. Sprinkle mixture of cinnamon and sugar between half of batter and on top after adding other half of batter. Bake 375 degrees for 15-20 minutes. Enjoy! Tip: If second half of batter doesn’t spread easily over top layer, simply take a knife and swirl together. Variation: I usually double the recipe (because it’s that good) and bake in a 9×13 pan, which requires extra baking time.